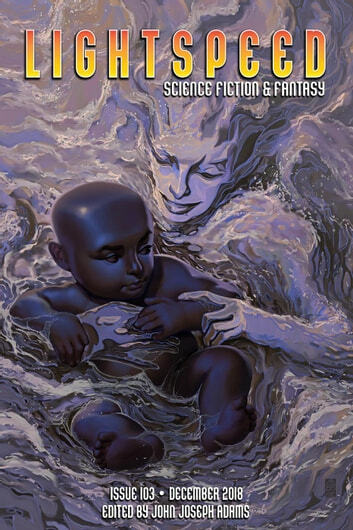 This month, our cover art comes from Marcel Mercado, illustrating the first story in a new series of fantasy shorts by Ashok K. Banker--"A Love Story Written on Water." Plus, we have a mouth-watering new short fantasy piece by Shaenon K. Garrity ("Grandma Novak's Famous Nut Roll"), and fantasy reprints by Adam-Troy Castro ("Of a Sweet Slow Dance in the Wake of Temporary Dogs") and Karen Lord ("The Counsellor Crow"). For science fiction, we have original shorts by Lizz Huerta ("Mouths") and Seanan McGuire ("Under the Sea of Stars"). We're also featuring SF reprints by Kim Stanley Robinson ("Remaking History") and Maurice Broaddus ("Vade Retro Satana"). All that, and of course we also have our usual assortment of author spotlights, along with our book and media review columns. For our ebook readers, we also have an ebook-exclusive novella reprint--"All the Flavors" by Ken Liu--and an excerpt from Mirah Bolender's debut novel, CITY OF BROKEN MAGIC.